We would love to welcome you to join with us on Sunday at either of our meetings. We are a friendly, local church and welcome visitors of any age or background. Our aim on Sunday is to praise and thank God for all he has done for us and to learn more about him. The morning meeting at 11am takes the shape of a more usual church service, including a talk to the adults, while the evening meeting at 6.30pm is more informal and encourages discussion and debate in small groups. After the morning meeting you are warmly invited to stay for tea, coffee and refreshments. We have a number of groups for children and young people - click here for more details. You can find out how to get to the Centre on the "Find Us" page. Yes. 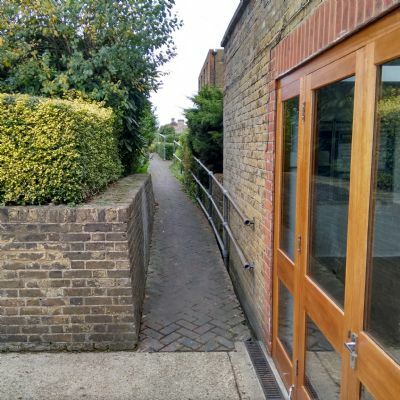 There is a long ramp to the left of the front doors - see the photo below - and another leading to the garden. Yes. Facilities are available on the ground floor. No. Whether you prefer to wear a suit or are happier in jeans, we would be delighted to see you. Is there a collection / offering during the meeting? No. There is no collection during any of our services. Sunday morning at 11am - we aim to be enjoying refreshments by 12.15pm. Sunday evening at 6.30pm - lasts no longer than an hour, however, we often stay to chat afterwards. What about the Lord's table / Holy Communion...? This normally takes place as part of the morning meeting after a short period of prayer. Stewards bring us the bread and wine while we remain seated, and we retain a piece of bread or a cup until all have been served, and then join together in eating and drinking after someone has given thanks. Those not taking part can simply sit and let the stewards pass by. If you are a visitor and a believer, you are welcome to join with us in this celebration. What can I expect from a Sunday evening meeting? We generally follow a series, either a book of the Bible or topical issues. To help inform and stimulate the discussions we use a mix of study guides and supporting DVDs. We tend to gather together at the beginning and end, breaking into smaller informal groups to discuss what we have seen and heard. Do you run other meetings or activities? Yes. We have a programme of events that can be found under the activities page. These include other church meetings as well as barbecues and picnics which are held in the Church garden.